Each has its place. What works best for you? Cantilever rack has little vertical or angled ends on each shelf support, and there’s open air between the supports, making it ideal for longer loads. Cantilever rack comes in many capacities and sizes from 250 lbs. per arm to the hefty 6,600 lbs. per arm variety (and more that aren’t necessarily listed on our site). 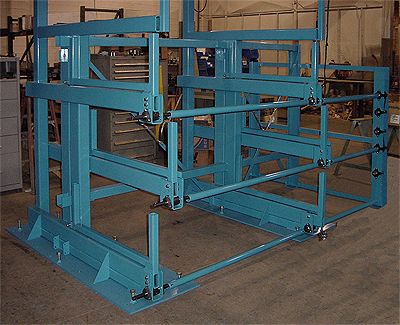 The lighter weight rack is primarily for smaller loads of lighter materials used in retail and fabrication shops. The heavy duty rack is for serious manufacturing where full bundles of elongated materials like steel pipe or heavy bar stock is stored. Most lighter duty cantilever is stationary rack without any moving parts, which is fine and good as long as you’re loading or unloading the rack in single pieces. Reaching up and in won’t cause much harm to the back and spine, nor much chance of serious injury from dropping the stock and breaking a foot or crushing a hand or arm. When you get into full bundle handling, you’re working with a different animal entirely, and it’s best to use rack with movable shelves. Being able to crank out the shelves to full extension makes everything easier from loading to unloading. You can now use manipulators and hoists to aid you and to keep the handling of loads more ergonomic and less physically taxing. The shelf gears are built to ratios that require minimal strength to get them going – so even the little petite thing down the aisle won’t break a fingernail when she has to crank out a shelf to get some long stock. Having crank out cantilever isn’t only for convenience – it’s for safety. By making the stock more ergonomic to handle, you reduce injury potential exponentially. Take manual handling of the stock out of the equation completely and safety risks are greatly reduced. You no longer run the risk of a load being dropped, spilled or scattered as it’s transported. Each load is handled by equipment built to move heavy loads safely. There are less back and spine injuries because there are far fewer incidents of stretching, twisting and bending to reach the desired stock. That’s the kind of material handling you want with hard to handle materials – convenient, safe, ergonomic and effective. Effective because you’re saving time and steps moving materials that are normally awkward to handle.